Are you a forgetful person and usually forget to send the photos of your friends to them? No problem, Facebook has invented an application for you that will reminds you this task. 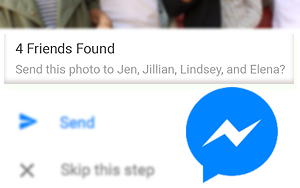 Oh, wait it is not a new application, it is your favorite Facebook messenger. A new feature that is called "Photo Magic" will do this task for you when it will come to know a new picture in your camera roll. The feature works by recognition of faces of your friends in the photos that you capture. It matches the newly taken photos with the old ones that you already have in your phone's storage, and then reminds you to send the photos to your friends. 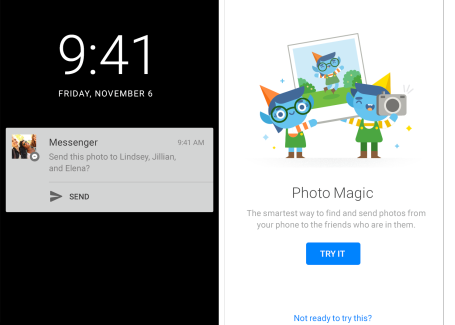 The app can automatically detect when you take a picture and make a popup notification at once on your Android device to ask if you want to share the photo with the people who are in it, and with a single tap can send it to them on Facebook Messenger. Or you could dismiss the notification if you don't feel like doing that. Director Of Product Management "Peter Martinazzi" said. On the Last weekend, Peter Martinazzi has himself proved just how bad people are at sharing photos. Him and his roommate decided to cut each other’s hair and take photos along the way, but Martinazzi never got the shots of his mangled locks because his buddy “still had the razor in hand”. Photo Magic would have let his roommate share each photo with one tap and get back to playing barber. The feature might sound a little bit creepy but it's completely optional if you don't feel like using it. The feature is rolling out now in Australia on Android and later on iOS and other parts of the world.